I read this article with close attention. The assumption of planetary influence on waring and killing is seems irrelevant according to references provided. We may need more scientific researches and study deeper than this. Of course, in some aspects, the moon and the sun trigger great gravitation on earth, but it seems human’s central gravitation such as greed, hatred and delusion have surpassed that. Wars are crazy behavior. When individuals act as crazy as nations or groups and begin killing others, they are locked up as fast as possible, given tranquilizers and other stronger drugs. Many people believe that ‘warring behavior is just ‘human nature’. ‘Wars are always going on.’ If a person denies such folk wisdom, it’s met with skepticism and rejection. But analysis of the data on wars shows otherwise. Wars are triggered by sunspots, which are in turn associated with heliocentric planetary positions. Sunspot data is now available for over two hundred years. Clear cycles have been observed with an average of about 10.3 years. Alexander Chizhevsky, a Russian scientist, observed that warring behavior was related to sunspot numbers. This was so radical an idea in the Soviet Union that Joseph Stalin put him in jail for over five years! Raymond Wheeler, a psychologist and historian at the University of Kansas (now deceased), came upon Alexander Chizhevsky’s observations and made further observations. He traced wars back 2,500 years and found war cyc1es in phase with solar cycles. Warring behavior is not a part of human behavior, it is not built in. Warring behavior is not always occurring. It waxes and wanes in a nearly regular fashion. By careful analysis of Wheeler’s original data I found that the start of wars occurred either when the solar cycle was rapidly rising or rapidly descending; never at the peak. Bar graph for this is shown in Figure 1. 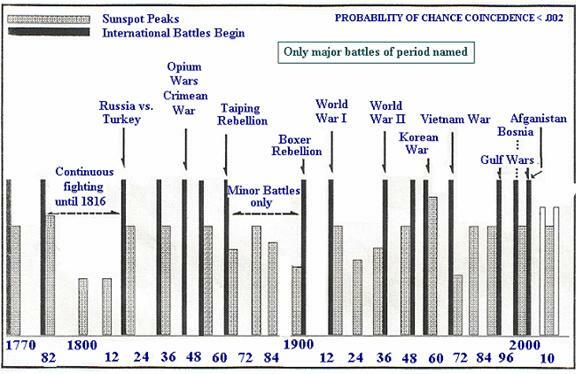 The black bars, representing the start of wars never coincided with the shaded bars representing sunspot peakes. This suggests it was the rate of change (derivative) OF THE SUNSPOT FORMATIONS that was important. Figure 1. Sunspot Peaks and Battles. Previous research had shown that sunspot formations were mostly associated with heliocentric planetary positions. Warring behavior is not built into human beings. It may be considered a kind of mass psychosis, mostly affecting men, analogous to PMS (premenstrual syndrome) in women. Average length of the sunspot cycles has been about 10.3 years until the last few when a protracted time of low sunspot formation has been taking place which is apparently a long sunspot cycle, although it only has been observed for a few cycles. Raymond Wheeler, a psychologist and historical at the University of Kansas (now deceased), came upon Alexander Chizhevsky’s observations in 1917 on sunspots and war cycles and made further observations. Alexander Chizhevsky was jailed by Stalin for over five years. Wheeler was probably disbelieved by his colleagues at the University, as I was as well when I spoke and wrote about this thirty years ago. After all, ‘wars are always going on’, ‘it’s just human nature’, are common notions among people. But it’s not the case. I observed that the start of warring behavior is fairly predictable and that warring appears to be more like a disease than a built in behavior of humans. It may be considered a kind of mass psychosis, mostly affecting men, analogous to PMS (premenstrual syndrome) for women, once thought to be a problem of self control in women, but now known to be a hormone imbalance related to a lunar cycle of females and associated with the menstrual cycles, men have their own ‘nutty’ cycle related to the Sunspot cycle. I call it MMS or Male Macho Syndrome. Not all men are affected, of course, nor do all women act a bit disturbed every month just before their menstrual period. Figure 2. Typical Sunspot Cycle. Robert Becker1 and colleagues, found that there were more psychiatric hospital admissions at times of geomagnetic disturbances. Certainly and obviously, warring behavior could be labeled ‘psychotic behavior’ and has puzzled people for centuries. Laboratory studies have shown that small magnetic fields can affect glandular secretions in the body. I, personally, have been making and using pulsed magnetic field generators for healing for many years. Not all types of magnetic force adversely affect humans and not all geomagnetic disturbances affect human behavior. I have found that solar flares, corona mass ejections, etc. are associated with heliocentric planetary conjunctions and some geomagnetic disturbances alone happen when planets are relatively near the Earth and the Moon is conjunct with them. Words by Georges Gurdjieff, teacher from Armenia, in the early nineteen hundred describe the mechanism. It is the result of planetary influences. Somewhere up there two or three planets have approached too near to each other; tension results. For them it lasts perhaps, a second or two. But here on Earth, people begin to slaughter one another, and they go on slaughtering maybe for several years. It seems to them at the time that they hate one another; or perhaps that they have to slaughter each other for some exalted purpose; or that they must defend somebody or something and that is a very noble thing to do; or something else of the same kind. They fail to realize to what an extent they are mere pawns in the game. They think they can decide to do this or that. But in reality all their movements, all their actions, are the result of planetary influences. And they themselves signify literally nothing. The Moon plays a big part in this. Figure 3 shows the solar system for March 7 when there is a full Moon and the Moon is also conjunct Mars called the ‘God of War’ by some people. Figure 3. Solar System (except for Pluto). March 07, 2012. From The Dynamic Solar System Software4. Around this day and for several weeks afterwards the Moon aligns with Mercury, Venus, Mars, and then Saturn in less than a week. The geomagnetic field will be rapidly fluctuating during these days and people will probably feel upset. Meditations will calm them and calm the Sun as well. Another dramatic planetary event is happening in March, 2012. 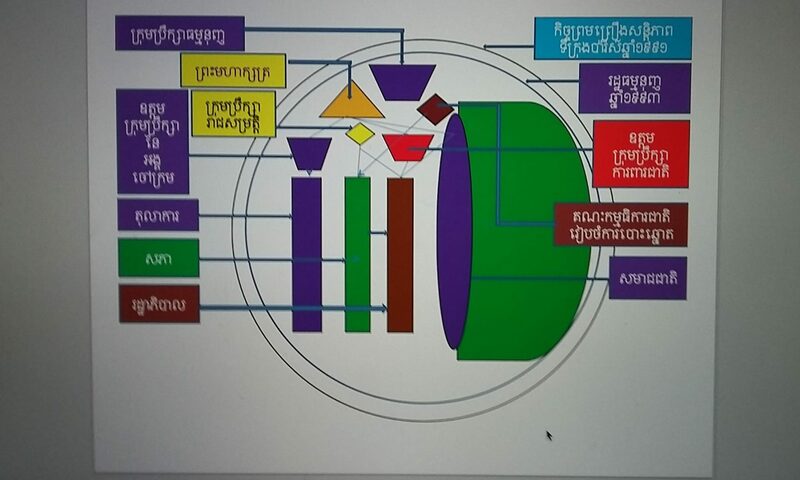 The diagram for one day in March is shown below. Figure 4. Solar System. March 21,2012. The magnetic field or geomagnetic field as it is called is said to be disturbed when particles from the Sun(called the solar wind), solar flares, or coronal mass ejections impact the Earth’s otherwise fairly quiet geomagnetic field, and disturb it. This is recorded everyday around the Earth and published from NOAA (government organization in Boulder, Colorado.) It is not a precisely measured quantity, there is a subjective element to it. Sunspot activity is also associated with heliocentric planetary conjunctions, that is when planets including Earth, align with the Sun and each other. Geomagnetic disturbances are also produced when the Moon is conjunct a planet and that planet is close to Earth in its orbit. Most people haven’t noticed this effect. My recently published book: “Planetary Influences” (Amazon) contains supporting information on this. It is mostly unknown to specialists who don’t study the dynamic solar system as a whole. It is not speculation it is observational from thirty years of looking. 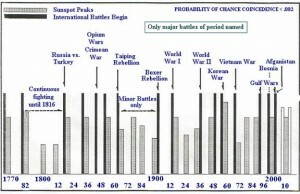 By careful analysis of Raymond Wheeler’s raw data of international battle I found that wars start most often when the sunspot activity is either on the rise or the decline of the activity level, newer at the maximum of sunspot activity. By looking what planets are involved an astrological friend and I found that Mercury, Mars, and Venus, when they were relatively close to Earth in their faster orbits, were often associated with the start of international battles. Sunspot activity is now starting to increase and the Sun may be on the rise again to a maximum in a couple of years. Looking at my software program: ‘The Dynamic Solar System” (available from www.burylsbooks.com) I noticed that next March, April and May 2012 until June 6, 2012, the Venus transit of the Sun, with a lunar eclipse are likely to be troublesome times. Some Mayan feared Venus transits as times of war. When the solar activity is on the rise, warring behavior in males may be likely. Prepsychotic males may “flip out” and start warring behavior. That includes a lot of political leaders. Prevention may be possible. Experiments and observations involving a span of thirty years, some on the full Moons, some on solstices and Equinoxes, have been observed to be associated with lower sunspot activity. Edgar Cayce, A well known psychic of the last century said mass meditations would help Earth by quieting the Sun. I thought this was nice sounding malarkey when I first read it over 40 years ago, and now have found it to be so! For example, in August solar activity dropped to zero the day after the meditation. In November solar activity also dropped to zero the day after meditation. Supporting data is in my book: “Planetary Influences”. When predictions are publicly made they often don’t happen. I don’t know why, but if some people say: “I don’t believe it!” that belief may be enough to contradict or cancel out the adverse prediction. This belief, combined with people who meditate and visualize a calm Earth and Sun will make a positive probably produce a reduction of any potentially troubling or warring behavior. There are a lot of good hearted sensible people in the world and their number is growing. Please join Global Meditations and Festivals on June 3-6, 2012 to offset any adverse effects6. So… I hope you, dear reader are not in the ‘wait and see’ group, but will take a strong proactive position and use your thought power. 1.Alexander Chizhevsky, “Physical Factors of the Historical Process,” (paper) Kaluga, 1924. 3. B.Payne, “PLANETARY INFLUENCES” CreateSpace. 2011. 4. B.Payne, “THE DYNAMIC SOLAR SYSTEM” software, $29 (for PC’s only).